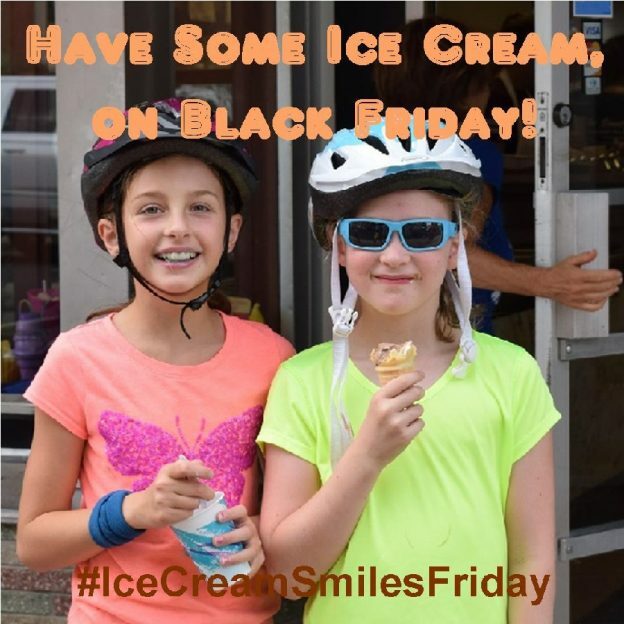 As Black Friday excites many, off from school and work as they take advantage of all the pre-holiday specials and fun, don’t forget to take a break from your outdoor activities and shopping today for some ice cream. With the leaves now bare and plenty of fun winter events scheduled, we hope you get out on your fat bike, X-C skies, snowshoes, etc. and enjoy all the winter’s active outdoor possibilities. See many more bike friendly places to explore in the new Minnesota Bike/Hike Guide. Thanks for viewing the Ice Cream Smiles Pic of the Day. Now rolling into our 10th year as a bike tourism media, our goal is to continue to encourage more people to bike and have fun. While showcasing all the unforgettable places for you to ride. As we continue to showcase more place to have fun we hope the photos we shoot are worth a grin. As you scroll through the information and stories we have posted, enjoy. As we continues to encourage more people to bike, please view our Destination section at HaveFunBiking.com for your next bike adventure. Also, check out the MN Bike Guide, now mobile friendly, as we enter into our 8th year of producing the guide. So bookmark HaveFunBiking.com and find your next adventure. And don’t forget to smile, while you are riding and having fun. We may capture you in one of our next photos that we post daily. This entry was posted in News, Picture of the Day and tagged #bikergirls, #blackfriday, #dairyidfa, #icecreamofinstagram, #icecreamsmilesfriday, #nextadventure, #nextbikeadventure, #onlyinMN, #yum, bike, bikersofinstagram, Fun Bike Meme, ice cream, Ice Cream Meme, ice cream smiles Friday on November 25, 2016 by Russ Lowthian. As the first winter storm blows through the upper Midwest, take a break and have some ice cream while reflecting on all the fun you had this last summer and what is ahead. 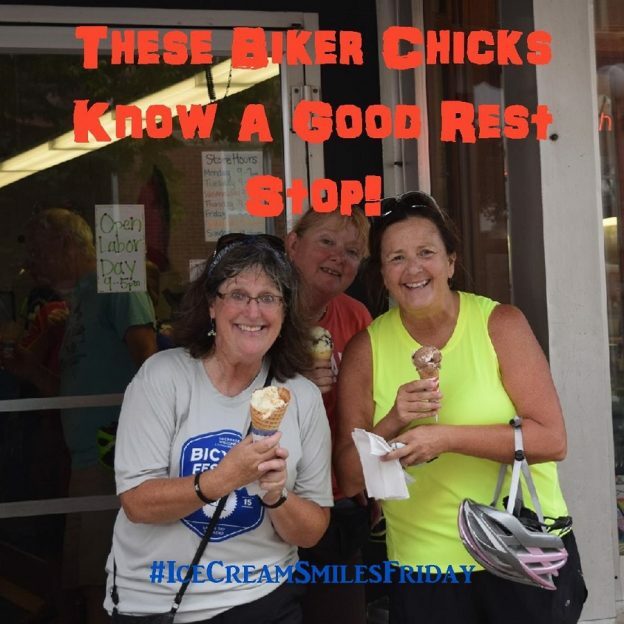 This entry was posted in News, Picture of the Day and tagged #bikechicks, #bikergirls, #dairyidfa, #icecreamofinstagram, #icecreamsmilesfriday, #nextadventure, #nextbikeadventure, #onlyinMN, #yum, bike, bikersofinstagram, Fun Bike Meme, ice cream, Ice Cream Meme, ice cream smiles Friday on November 18, 2016 by Russ Lowthian. It’s Ice Cream Smiles Friday and these ladies know a where to find a rest stop with a cool treat this afternoon. Photo was taken at the La Crosse Bicycle Festival that is held each year over Labor Day Weekend. With the leaves turning and perfect biking weather today, we hope you get out on your bike and enjoy all the fall riding possibilities. See many more bike friendly places to explore in the new Minnesota Bike/Hike Guide. 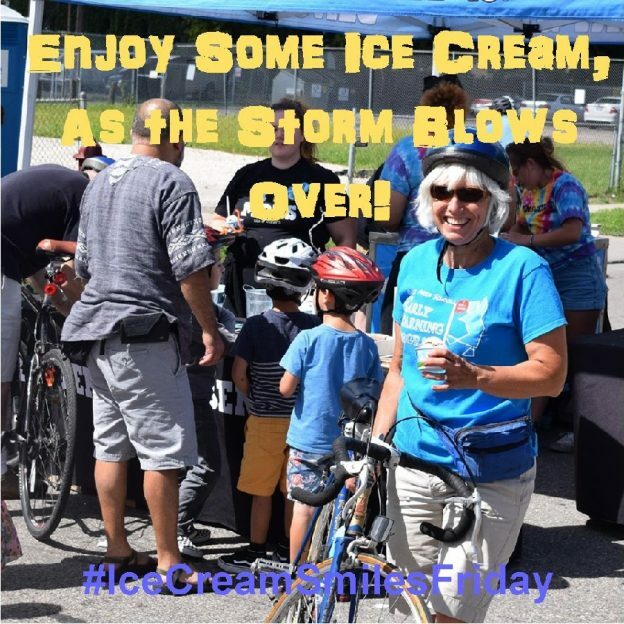 This entry was posted in News, Picture of the Day and tagged #bicyclelacrosse, #bikechicks, #bikergirls, #dairyidfa, #explorelacrosse, #icecreamofinstagram, #icecreamsmilesfriday, #nextadventure, #nextbikeadventure, #yum, bike, bikersofinstagram, Fun Bike Meme, ice cream, Ice Cream Meme, Ice Cream Meme ice cream smiles Friday, ice cream smiles Friday, La Crosse Bicycle Festival on November 11, 2016 by Russ Lowthian. 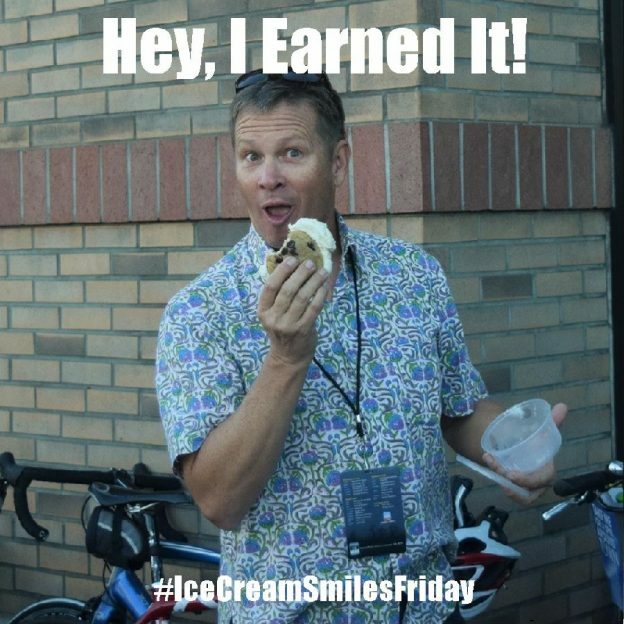 It is Ice Cream Smiles Friday and this cyclist had a tough week earning him his cool treat. Photo was taken last year at the National Bicycle Tourism Conference in San Diego, CA. See more fun photos of the 2015 Conference here. With the leaves turning and perfect biking weather today, we hope you get out on your bike and enjoy all the fall riding possibilities in Minnesota. See many more bike friendly places to explore in the new Minnesota Bike/Hike Guide. This entry was posted in News and tagged #dairyidfa, #icecreamofinstagram, #icecreamsmilesfriday, #NationalChocolateDay, #nextadventure, #nextbikeadventure, #yum, Fun Bike Meme, ice cream, Ice Cream Meme, Ice Cream Meme ice cream smiles Friday, ice cream smiles Friday on November 4, 2016 by Russ Lowthian. It’s Ice Cream Smiles Friday and all she wants is a lick. Especially because its National Chocolate Day and his cone is full of white chocolate and raspberry chunks. Photo was taken at the La Crosse Bicycle Festival that is held each year over Labor Day Weekend. 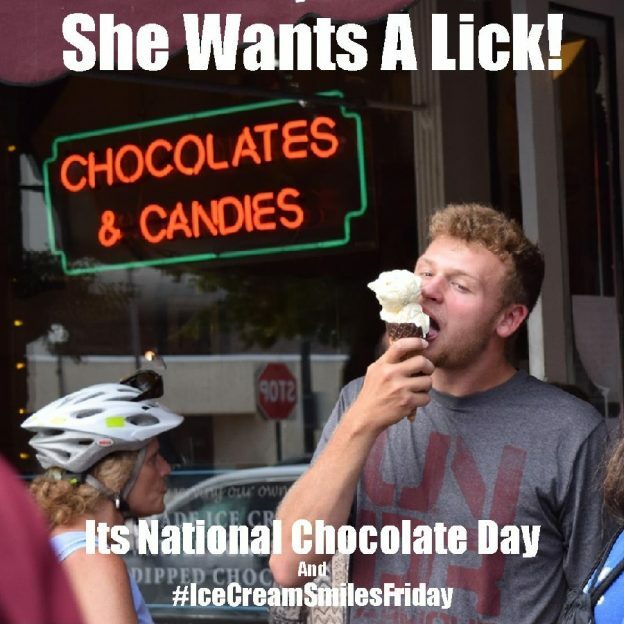 This entry was posted in News, Picture of the Day and tagged #dairyidfa, #icecreamofinstagram, #icecreamsmilesfriday, #NationalChocolateDay, #nextadventure, #nextbikeadventure, #yum, Fun Bike Meme, ice cream, Ice Cream Meme, Ice Cream Meme ice cream smiles Friday, ice cream smiles Friday, La Crosse Bicycle Festival, National Chocolate Day on October 28, 2016 by Russ Lowthian. 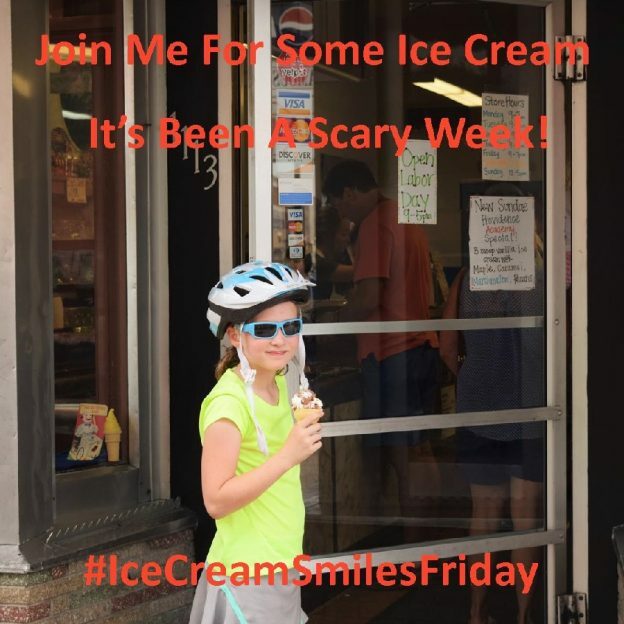 Participating in Ice Cream Smiles this Friday may help you take the edge off some of this week’s crazy and scary happenings. Photo was taken at the La Crosse Bicycle Festival that is held each year over Labor Day Weekend. With the leaves turning and perfect biking weather, we hope you get out on your bike and enjoy all the fall riding possibilities in Minnesota. See many more bike friendly places to explore in the new Minnesota Bike/Hike Guide. This entry was posted in News and tagged #creepy, #dairyidfa, #icecreamofinstagram, #icecreamsmilesfriday, #nextadventure, #nextbikeadventure, #onlyinMN, #yum, crazy events, Fun Bike Meme, ice cream, Ice Cream Meme, ice cream smiles Friday, scary events on October 21, 2016 by Russ Lowthian.